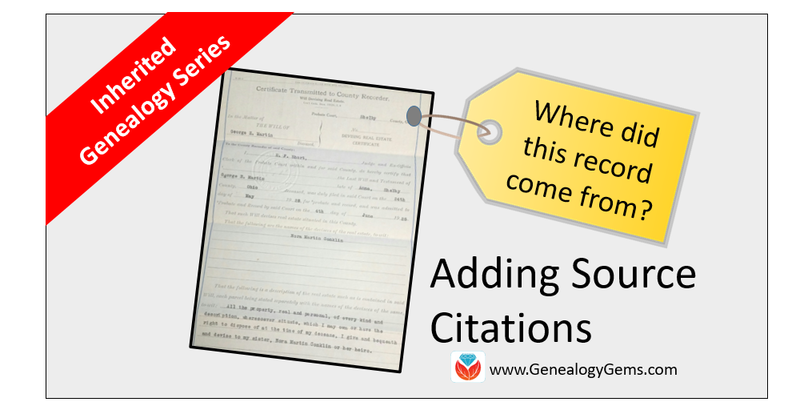 Adding Source Citations is our third post in the Inherited Genealogy Files series, and in this post, we answer a listener’s question. Thank you for your tip about starting from the present and working backwards. I was having a hard time knowing where to start. I had inherited a tree passed from my mom and my great-grandmother, that when combined with the information my husband’s aunt gave me [I had a] tree with almost 1200 names. But the information from my great-grandmother and my aunt does not have any sources and all of my mom’s sources got lost in our various moves over the years. She only had her old school database that just had the facts and no sources. I determined that a genealogy book my mom used as a source for one of our lines [had been] copied [from] an older genealogy line that has been proven incorrect. So, my goal has been to re-find my mom’s sources and document everything. I didn’t know where to start. I have now made a second tree in my database keeping the original as a place to start and only putting what I have proved using actual sources and attaching the documentation as I go. Your episode on the Genealogical Proof Standard was really helpful. It will be a big help as I clean up my tree. Let’s first give a brief definition of source citation. 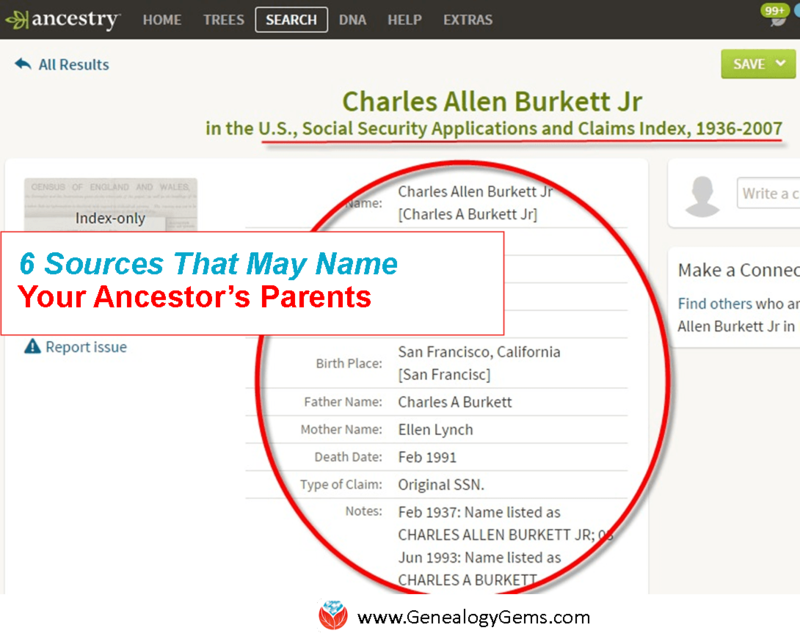 Source Citation: the information that tells your reader where you obtained a particular piece of genealogical data. For example, a family tree should include a source citation for the birth date and place, the death date and place, and the marriage date and place…and that’s just the start. 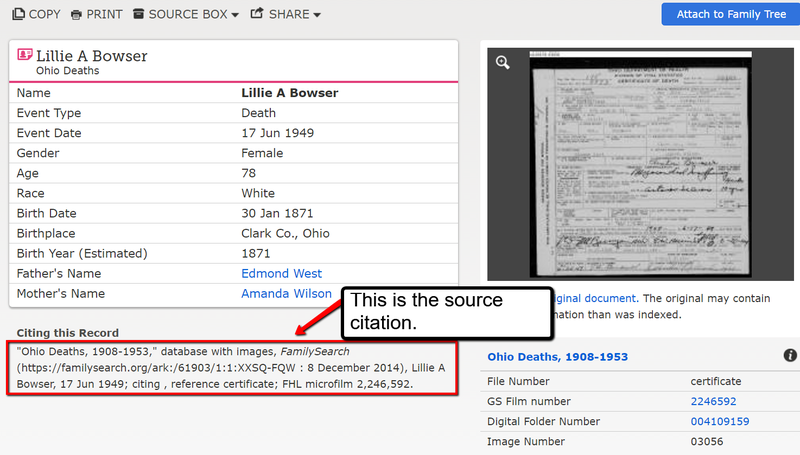 Finding source citations is really easy if you are using FamilySearch. Let’s say I used a death record I found online at FamilySearch as the proof of my ancestors death date. 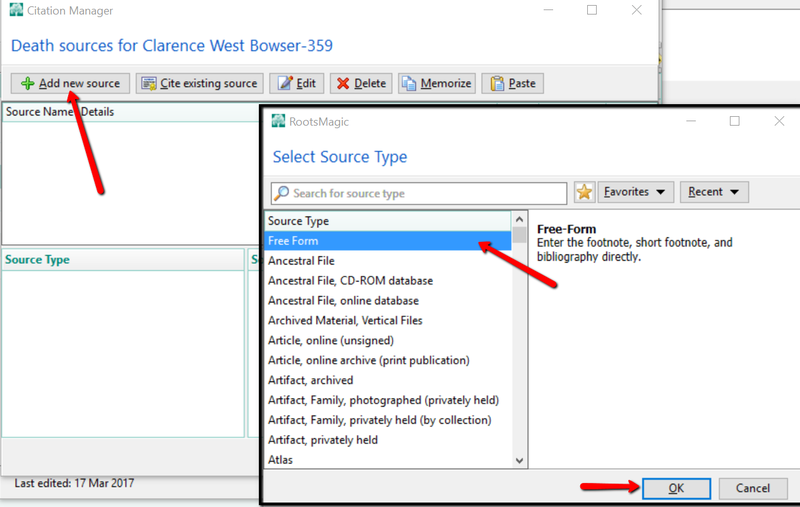 What is so wonderful about using FamilySearch.org for finding records is that it includes a source citation for you to copy and paste. Take a look. 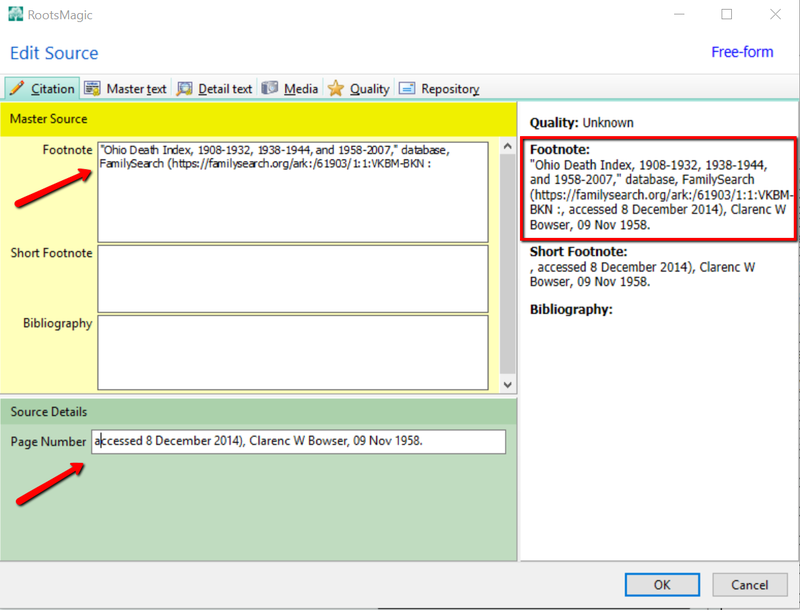 You can highlight the source citation text and copy it into your genealogy software. 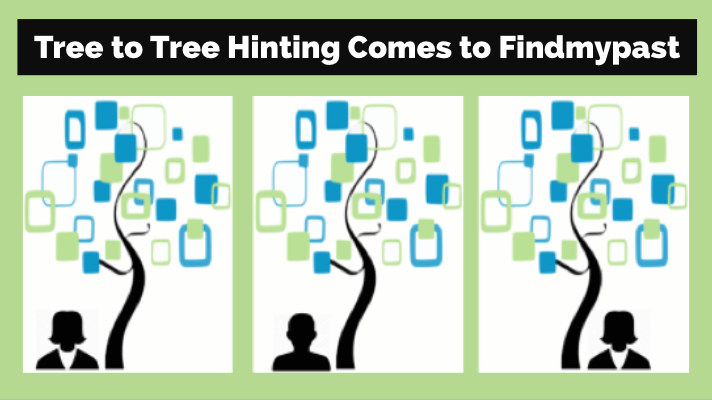 A bonus is knowing that FamilySearch is free and easy to use. In this example above, we have double clicked on Clarence’s name and opened up the Edit Person window. We would like to add a source citation for Clarence Bowser’s death date and place. In the line for death, we click on the box in the source citation column. The source citation column is indicated by that little icon that looks like a record. 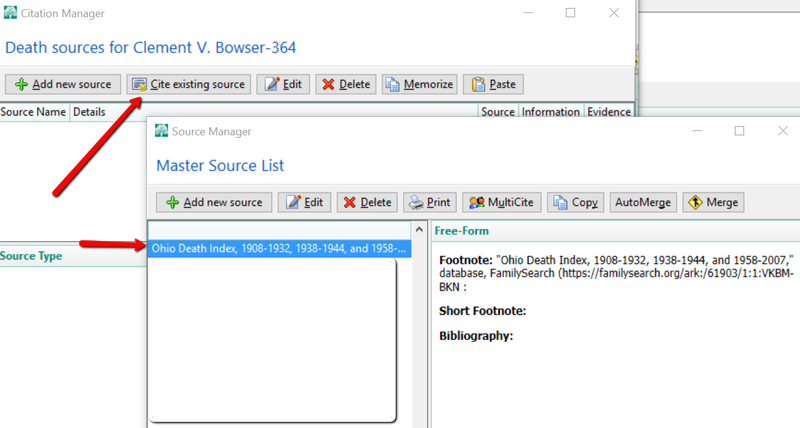 At the pop-up window, we click Add new source and from the options, choose Free Form and click OK.
“Ohio Death Index, 1908-1932, 1938-1944, and 1958-2007,” database, FamilySearch (https://familysearch.org/ark:/61903/1:1:VKBM-BKN : accessed 8 December 2014), Clarence W Bowser, 09 Nov 1958. The first part of the citation is the title of the collection and the location you found it. “Ohio Death Index, 1908-1932, 1938-1944, and 1958-2007,” database, FamilySearch (https://familysearch.org/ark:/61903/1:1:VKBM-BKN. That front half of the citation is going to go in the Footnote area of the next pop-up window. The remainder of the citation you copied is going to go in the Page field. Then click, OK.
Notice, the entire footnote at the right of the screen looks like the one you copied from FamilySearch. You may wonder why on earth we separated the citation. 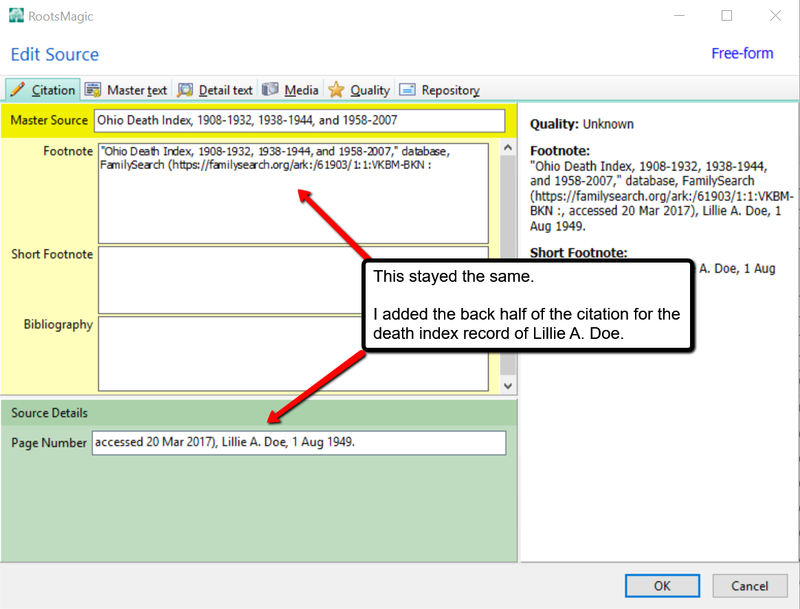 Because, RootsMagic is going to remember you have a source citation from Ohio Death Index, 1908-1932, 1938-1944, and 1958-2007. 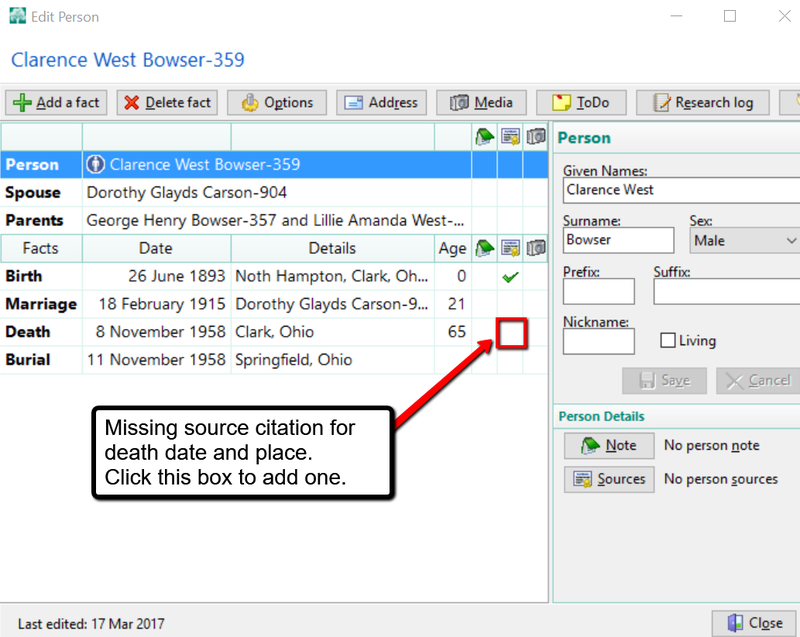 The next time you find an ancestor’s death record in this index, you will not need to click Add new source. Rather, you will click Cite existing source, and choose the Ohio Death Index, 1908-1932, 1938-1944, and 1958-2007. At the next screen, the Footnote field will already be filled out for you. All you need to do is fill in the Page field with the back-half of the new source. 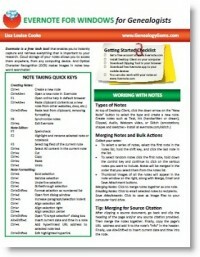 You can get loads more tips and tricks in our helpful Evernote for Windows for Genealogists quick reference guide (also available for Mac users). Also, get a quick overview about this amazing product from this video clip on our YouTube Channel. Hi Larry! Glad you liked it!